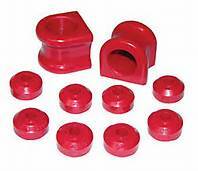 Bushings are used as an insulator or a kind of barrier in a place where there would be metal on metal contact between two moving parts. The location of a bushing can be in multiple ares of your vehicle. More commonly bushings are used in many different areas of the suspension and steering linkage components. What types of materials are bushings made of? The type of material a busing is made of depends upon its intended job. Bushings are made of many different types of materials such as a hard rubber, plastic type material, polyurethane or even aluminum. All bushings are considered a wear item and with time need to be replaced. Over time the bushings used on your vehicle can get soft, corrode or just plain come apart. When the wear or deterioration is noticeable you can feel more movement and often a new noise appears. The wear rate of a bushing really depends on its location and what the part is designed to do. Worn bushings need to be replaced and this job can be completed by most end users or a shop if needed. What are the warning signs that your vehicles bushings may need to be replaced? You hear a clunk when going over a bump. The is a new unexplained vibration at idle. Your vehicles handling has suddenly changed. There is a new squeak when the suspension cycles. Your suspension begins to thump or creak. You are experiencing a vibration that may be from a cracked or worn bushing.